Abuja, February 6, 2018: The China News Agency, Xinhua, is seeking ties of collaboration with the Liberian media. A release from the Liberian Embassy in Abuja says Xinhua, the official news agency of the People’s Republic of China, also intends to facilitate economic information with the National Investment Commission (NIC) of Liberia. According to the release, Xinhua made the disclosure when two of its African executives paid a courtesy call on Ambassador Al-Hassan Conteh earlier this week in Abuja. 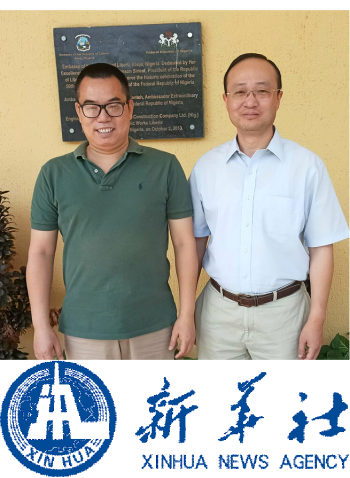 Mr. Wang Jida, the General Manager of the Africa Regional Bureau and Mr. Baoping Zhang, Abuja Bureau Chief of Xinhua News Agency will travel to Liberia February 8-10, 2018 to discuss the facilitation of a fruitful cooperation with the local media. They also hope to hold discussions with the NIC with the plan to facilitate the exchange of economic information. Mr. Wang says Xinhua can be the bridge between Liberia and China in helping to deepen the already strong bilateral ties between both countries, the release continues. “During the visit, we intend to promote the exchange of videos, pictures and print news with the local media. We also plan to facilitate the exchange of economic information with the National Investment Commission as a way of bridging the gap the Liberian Government and prospective investors”, he explained. For Mr. Baoping, Xinhua as China’s national media wants to push and promote trade and investment between both countries because, according to him, information is very important in Liberia-China relation: “We will also provide economic information”. The release says the Chinese national media hopes to also identify its Liberian correspondents for both print and photography during the visit. “We want to expose Liberia to the world through our news agency”, Mr. Baoping added. Ambassador Conteh, in response, lauded the Chinese media executives for their desire to collaborate with the Liberian media and the NIC, the release adds. The Liberian Envoy recalls President George Manneh Weah’s inaugural address delivered few weeks ago in which the Liberian leader hailed China’s as “one of Liberia’s most dependable allies”. “I wish you well on your trip to Liberia as you meet and hold fruitful discussions with the relevant authorities during your two-days’ working visit”, the release quotes Ambassador Conteh as stating. Xinhua, as the official news agency of China, covers news about politics, economy, sports and other areas of interest in many languages including English and Chinese. Founded in 1931, Xinhua has over 10,000 full-time journalists and over 180 branches worldwide including its Abuja Bureau. Besides print and video news, Xinhua has an economic information service which began since the 1980’s.